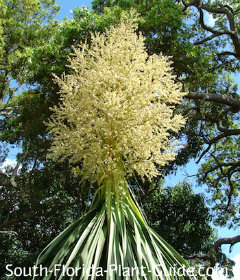 Cute, whimsical, weird and unique describe the ponytail palm - not actually a palm at all, but a succulent palm-like relative of the yucca. 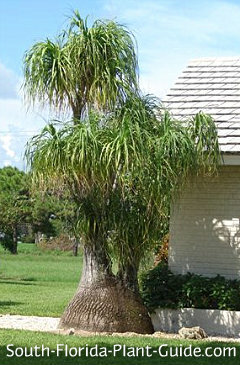 Often planted as a small landscape palm because of its extremely slow rate of growth, the ponytail can eventually grow to 30 feet...but it takes a very long time. The ponytail is sometimes called "Elephant Foot Tree" - the swollen gray base looks like an elephant's foot. The base is topped with cascading ribbon-like leaves that can grow 6 feet long and only an inch wide, hence the name "ponytail." Ponytails are an armchair gardener's dream - they thrive on neglect... drought-tolerant, easy-care plants with a myriad of landscape uses. 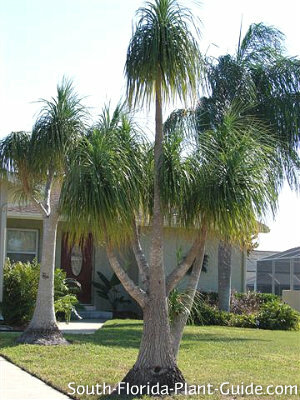 Excellent near the entry, this "palm" will be an entertaining tropical accent, or use it as a small sentry at the entrance to a walkway. It can thrive in a container, too, for pool, patio or balcony areas and even indoors. This is a very slow-growing plant, fine in sun to part shade. It's moderately cold-tolerant and works well in Zone 9B with protection from freezes. No two are alike - some of these "palm trees" stay short and stout while others grow tall and slim. 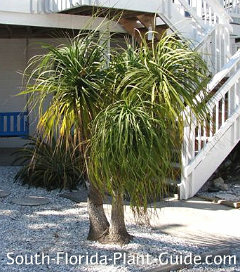 A more mature ponytail palm tree will bloom with white flower clusters and then branch out to form new heads. No need to add soil amendments when planting, since this plant likes dry sandy soil. The trick with ponytail palms is not to overwater. This doesn't mean give it a tiny drink...it means give it a long thirst-quenching one and then let it dry out before watering again. This is a great plant to mix with other drought-tolerant plants. Fertilize 3 times a year - once each in spring, summer and fall. Trim off browned fronds as needed...usually removing the lower ones a few times a year is sufficient. Ponytails can be planted fairly close to the house - come out 3 to 4 feet to allow clearance (gutters and eaves) for eventual height. If you're placing them in rows, an ideal distance would be about 5 feet apart. This makes a great container plant, with its slow growth and drought tolerance. For an indoor plant, make sure it gets plenty of sunlight and isn't overwatered. COMPANION PLANT SUGGESTIONS: Best if interplanted with low-growers that like it on the dry side: juniper, crown of thorns, dwarf clusia, Indian hawthorne, Muhly grass, bulbine, and ice plant. My new Updated Edition is here! Check it out!